What Phone Number Do I Call? Full information about the First Dolphin Attunement is here. If you've already received your First Dolphin Attunement, we're showing these dates here in case you'd like to refresh! Click here for everything you need to know before your First Dolphin Attunement. Receivers of Dolphin Attunements 2, 3 or 4 participate together on the same day, in the same call. This means that you can be receiving your second Attunement on the same call as someone else who is receiving her fourth Attunement. To be clear, each of you is receiving one Attunement, whichever is next for you. Dolphin will know which Attunement you're receiving. Click here for everything you need to know before your 2nd, 3rd or 4th Dolphin Attunement. You'll likely notice a big upwards shift in what you receive, even beyond the experiences of the first four Attunements. These are also the Attunements when Whale joins with Dolphin to transmit the Attunements! You will want to create plenty of open time and space to “just be” after receiving your 5th or 6th Attunement. Click here for everything you need to know before your 5th or 6th Dolphin Attunement - including links to our favorite whale music recordings! The Seventh Attunement is “the biggie!” - the completion of the journey. In the Seventh Attunement, your human consciousness merges permanently with the dolphin consciousness. You will emerge from your Seventh Dolphin Attunement a brand new being upon planet Earth. This Attunement is so powerful and profound, you’ll definitely want to allow plenty of open time and space to “just be” after receiving it. Archie has told us that the integration of the Seventh Attunement never really ends, and that the value of receiving this gift continues well beyond this lifetime. Click here for everything you need to know before your 7th Dolphin Attunement. Our primary focus for these Unity-Community calls is to provide support and connection for those of you swimming through your Dolphin Attunement Journey. Of course, our beloved Starmates are also welcome! During these calls, we love hearing about ~ and celebrating! ~ the new perspectives, discoveries, choices, and conscious actions you are experiencing. This is also the place to bring any questions you have about the dolphins, or this journey, as well as requests for healing or support. All the while, we are nourished, nurtured, uplifted, and held in the warm, loving, and safe container that we, and Dolphin, co-create together. We usually schedule these on Wednesdays, but occasionally we need to move it to Tuesday. We are now using Zoom videoconferencing for these calls, so we can see each other as well as hear each other. If you're not set up on your computer, you can still call in by telephone. But this is a different system than the one we use for Attunement calls, with different phone numbers. Click here for full connecting instructions. If you haven't yet received your First Dolphin Attunement, the information about that, and the link for the sign-up page, is here. If you've received your First Attunement, and you're ready to sign up and select your payment arrangement for the rest of the Dolphin Attunement Journey, you can do that here. Many of our podmates enjoy receiving specific Dolphin Attunements again from time to time, as a way to stay connected and current with the ever-expanding Attunement frequencies. We call this Refreshing an Attunement. Refreshing an Attunement is always a completely new experience. Podmates often report that their refresh experiences are more powerful and profound than the experience they had the first time they received that Attunement! It is never necessary to refresh a Dolphin Attunement. Once you receive a Dolphin Attunement, the effect is permanent. It will continue to integrate and expand in your experience forever. And ... it is always beneficial to refresh an Attunement. you allow yourself to be touched even more deeply. and you open more fully to the gifts of the dolphins. Once you've received a particular Dolphin Attunement, you can refresh it, any time it is offered, for $44. Podmates have told us this is the best bargain in Dolphin Heart World. You may feel spontaneously guided to refresh a specific Dolphin Attunement. The later Attunements - the Fourth, Fifth, Sixth and Seventh - are particularly popular for refreshing. We always recommend that you tune into your dolphin guides and your own inner wisdom, and trust you will be guided to the perfect Attunement for you to refresh, at the perfect time. You can also choose to refresh all of the Dolphin Attunements, in order. This makes sense if you have been away from the Attunements for a long time, or if you feel you've reached a whole new level in your life, and you'd like to re-receive the entire Dolphin Attunement Journey from where you are now. If you'd like to refresh the entire journey, we offer the option of refreshing all 7 Dolphin Attunements for the special reduced price of $244 ($66 savings). U.S. and Canada phone number: 1-712-770-5505. Access Code: 544066 followed by the # sign. For the benefit of our international friends, our conferencing service also provides local phone numbers in more than 70 other countries. If you're outside the U.S., click on this link to get to our conference call information page. 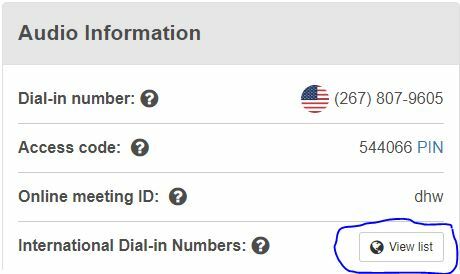 When you click on View List, you'll see all of the available international phone numbers, so you can check whether there's a local number in your country. We offer each of the 7 Dolphin Attunement transmissions once each month. The Unity-Community call for our Dolphin Attunement Journey podmates generally happens each month on the Wednesday after the Saturday when we transmit Dolphin Attunements 1 and 2-3-4.. Occasionally, because of holidays or travel commitments, we have to adjust these schedules. We suggest that you bookmark this page, and always check here to confirm the date and time of your next Attunement! Free Weekly Dolphin Energy Healing Tele-Circles every Thursday at noon, Pacific Time. We offer Unity-Community Calls once a month - see the schedule above. Many podmates choose to receive personal dolphin healing sessions with us, in between their Attunements, and find this to be a very potent combination! The Dolphin Attunements bring everything up. The in-depth personal attention and safety of a personal healing session accelerates the healing, transformation, and release of personal core issues that rise to the surface. Linda offers Personal Journey Sessions, and David offers Journeys of Discovery with Archie. If you're not sure which of these sessions would be best for your situation, we're happy to talk it over with you. It's an honor and a joy to give you personal support in this way. Last but not least, if you have not yet read Linda's book, Dolphin Love ... From Sea to Land, we highly encourage you to do so! It's Linda's personal account of her 7-year inner journey with the dolphins, which gave birth to the Dolphin Attunements and the journey that you are now on. This book is a great one for anyone to read; but it's particularly meaningful to those of you who have said Yes to this journey. Think of Dolphin Love as your Dolphin Attunement Journey Guidebook that you can turn to at any time for insights, inspiration, wisdom, and yummy healing dolphin frequencies.